Recently, we had the uncommon pleasure of receiving correspondance from the proprietor of Municipal Prints Company in Brooklyn, New York. 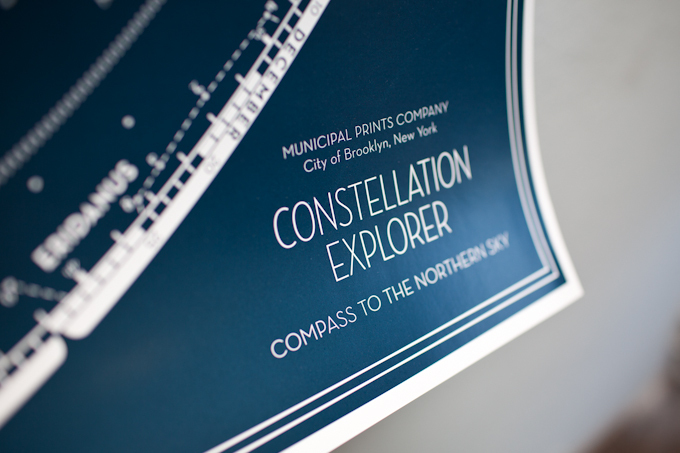 Sheldon had an inkling that his Constellation Explorer series would be right up our alley - and he was definitely right. Sidebar: As someone who's never been to New York (shameful, I know...), this is what I picture when I think about Brooklyn. "Never fear, Brooklyn is here!" And outfitted Sheldon with some new letterpress business cards! We really love having the opportunity to barter with our fellow artists and designers. It's a win-win! We're enjoying our new print in the studio right now, but will soon be bringing it home to hang there. I'll make sure to update you when it's found an official place in our home.